Opposition candidate Felix Tshisekedi has won the Democratic Republic of Congo’s tightly contested presidential vote, the electoral commission says. Provisional results put him ahead of another opposition candidate, Martin Fayulu, and the ruling coalition’s Emmanuel Shadary. If confirmed, Mr Tshisekedi will be the first opposition challenger to win since the DR Congo gained independence. Current President Joseph Kabila is stepping down after 18 years in office. He had promised DR Congo’s first orderly transfer of power since the country’s independence from Belgium in 1960. The election outcome was initially expected to be announced on Sunday. The interim result can still be challenged. In the early hours of Thursday the head of DR Congo’s National Electoral Commission (Ceni), Corneille Nangaa, said Mr Tshisekedi had received 38.5% of the vote and had been “provisionally declared the elected president”. Mr Tshisekedi, who is the son of late veteran opposition leader Etienne Tshisekedi, told supporters at his Union for Democracy and Social Progress party headquarters in Kinshasa that Mr Kabila should no longer be seen as a rival. “I pay tribute to President Joseph Kabila and today we should no longer see him as an adversary, but rather, a partner in democratic change in our country,” he said. Mr Tshisekedi has promised to make the fight against poverty his priority. Mr Fayulu, a former oil tycoon, dismissed the results as having “nothing to do with the truth”. And France appeared to back him: the foreign ministry said the announced results did not reflect the vote. How will Congolese citizens react? This is a historic moment for Mr Tshisekedi’s party, the UDPS, who have tried unsuccessfully to win power for decades. But in recent days, rumours of a deal between Mr Tshisekedi and Mr Kabila have raised concerns among other members of the opposition. Mr Tshisekedi himself has acknowledged talks with the ruling party to prepare a transition of power. Candidates can appeal results if they wish and the final decision will be announced by the constitutional court. The big question now is how the country will react. There are serious concerns of unrest if people conclude that results have lacked in credibility. The Catholic Church, which deployed the largest number of election observers, has warned they will reject any results they believe to be fraudulent. On Wednesday, anti-riot police were deployed in the capital, Kinshasa, amid fears that a disputed result could trigger violence. Polling at the end of last month was marred by allegations of vote-rigging. The influential Catholic Church warned that there had been irregularities. The leaders of Zambia and South Africa urged officials to release the tally quickly to avoid growing suspicion around the poll, which has been marred by allegations of fraud. On Tuesday, Mr Fayulu warned election officials not to “disguise the truth” as tensions continued to mount over the delayed result. After the 30 December vote, internet and text-messaging services were shut down nationwide in a move that the government said was necessary to guard against the spread of unofficial results. 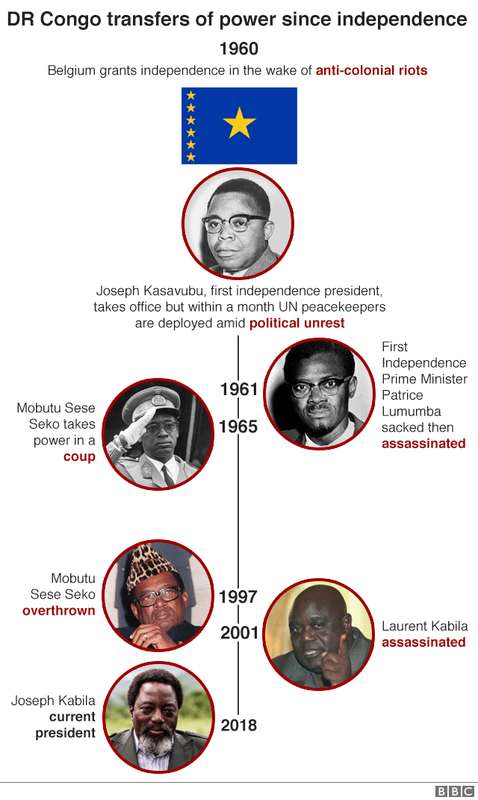 Mr Kabila took over from his assassinated father Laurent in 2001. He was elected in 2006, and secured another term in controversial elections in 2011. He was barred from running for another term under the constitution, and was supposed to step down two years ago, but the election was postponed after the electoral commission said it needed more time to register voters.